Just thought I would throw these pics up here to show you guys a few things from Down Under. First off we have a Surface-Mount socket Outlet, these are rarely used here now, but at one time a lot of switch boards had them. 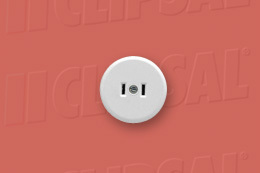 Next up is a rather strange looking thing, it's used for appliances where you need an extra switched phase, for instance Non-maintained Emergency lighting. Dave and I were talking about this connector the other day in the Chat room, here is the picture Dave. A lot of kettles here used this sort of connector before the IEC connector was used here on imported appliances, as older kettles burn out, the plug arrangement is becoming more rare. Rated at 10A so I'm told. Please by all means, put your 2c worth in here!. Re the double adapter, that reminds me of an item in Electronics Australia some years ago. 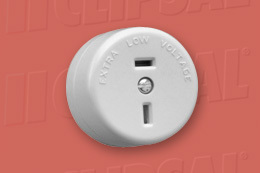 Somebody described an old double adapter which was built in such a way that the polarity was reversed on one of the outlets. It seems that in the early days of the Australian plug standard there was no specification as to which side should be line and neutral (or should that be "active" and neutral? ). The double adaptors that had the polarity problems were manufactured by Clipsal in South Australia (part number 460). The bottom half of the adaptor had the correct polarity LIVE was the left pin) but the other side was incorrect. Another Clipsal oddity from the past was the first of the combination socket-outlets had the earth pin facing up (reminds me of some of the disussion amongst the contributors in the 'general discussion' forums of ECN). I have one at home with '58' stamped on it (assume 1958 manufacture). If I have time, I shall dig it out along with some of the other oddball fittings I have including the Aussie 110V 10A plugs (round pins for Active & Neutral with a flat earth pin). The surface sockets still kick on to this day installed in equipment racks from the 1970s & 1980s. 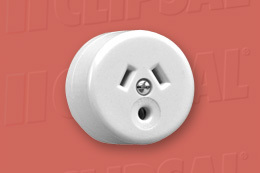 I've got a couple of those surface-mount Aussie sockets. I guess most people use them to wire up workbenches. That's how I did mine anyway. As for the "kettle plug" those are also sold here, except most of the times they come pre-assembled to a length of HPN (heater parallel neoprene) cord with a molded two-pin plug for the wall socket. They call the "iron plugs" here and are usually used for coffee machines. 10 Amps for that tiny switch is a bit much, isn't it? Rocker switches like that are normally rated for 5 amps at 125 volts, I think. The bigger ones are more for 15. I heard those are used for things like sheep-fur clippers? I've seen another version of that Iron / Kettle plug on our old vacuum cleaner! It looks identical to that but has pins in a / \ configuration. I must get me some of that Sheep-fur. Don't take it personally mate, just having a bit of fun. Yeah....what can I say, I hadn't started swigging my morning coffee yet. A few minutes after I posted that, I remembered the word. Oh. FUR. Well Mike should know the word if nobody else can remember it. What are the figures for New Zealand -- 5 million people and 15 million sheep? Sven, you aren't that far out of character, a Cattle-beast escaped after a truck rolled near one of the trendy parts of Auckland recently, people there had seen these things in books. 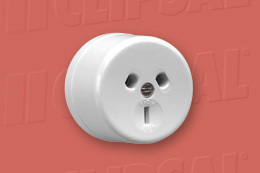 This socket is rated at 32VAC 15A or 110VDC 15A. 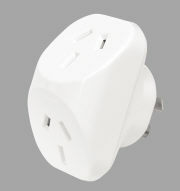 It was designed for 32 volt use for farms but this plug has found its way into caravans & motor homes for 12 VDC supply. Not too common but this is designed for 110VAC 10A supply, the welding equipment manufacturer CIG (now BOC) use these for a 77 volt supply for some welder ancillaries on older machines. This is used for 230/240 VAC 10A supply for special purposes use i.e. lighting points. Some people also use these for 110 volt supply while others use it for 12 or 24 VDC. This beastie is rated for 240V 10A, most probably for clock circuits. Not that common, some 240-110 stepdown transformers were fitted with these as NEMA1-15 plugs fit quite nicely.